Today, we are fortunate to have a guest post written by Kadee Russ, Associate Professor of Economics at University of California, Davis, and formerly Senior Economist for International Trade, Council of Economic Advisers. Recently, Furman, Russ, and Shambaugh (2017) provide evidence that tariffs are a regressive form of taxation, drawing on insights from Fajgelbaum and Khandelwal (2016) and others. 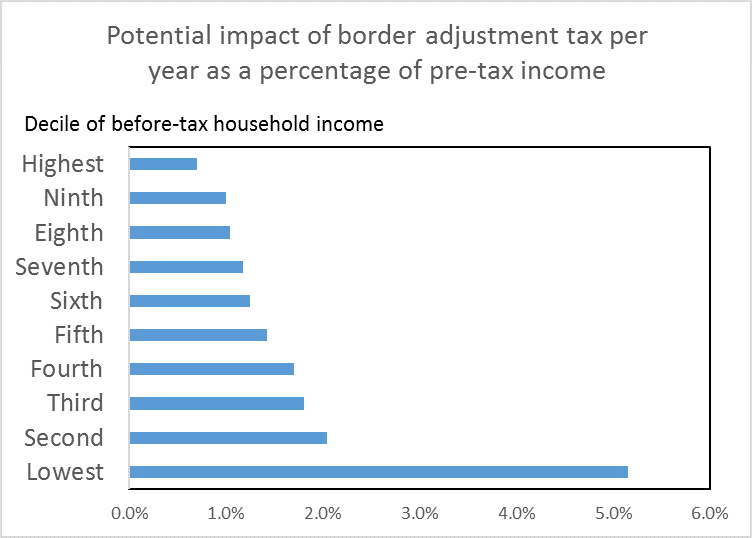 Here, I expand on that work to give initial ballpark estimates for the impact of the border adjustment tax on households in different parts of the income distribution. The impact falls hardest on the lower- and middle-income households and the magnitude is considerably greater than the current U.S. tariff schedule imposes. Will a strong dollar cancel out the effects of the border tax on households? Some analysts argue that the balance of the tax on imports and the tax break on export sales would strengthen the dollar enough that the border adjustment would not affect the purchasing power of consumers or firms with respect to imports. While the theoretical models are suggestive, this is an open empirical question that would benefit from careful empirical investigation. Were it indeed the case that exchange rate and wage adjustments would fully offset the tax on imports, which no one at present can say with certainty, the general equilibrium responses involved could take at least two years to occur if the existing literature on pass-through in traded goods prices is a guide. This analysis takes a middle ground. I suppose that frictions impeding general equilibrium adjustments in exchange rates and wages, as well as other factors well known in the pass-through literature, prevent the full general equilibrium responses that would wipe out the impact of the border tax adjustment. I assume that half of the proposed 20 percentage point border adjustment tax is passed into prices paid by buyers of imported goods. True believers in general equilibrium thus might look at this as a short- or medium-term scenario (1-3 years). General equilibrium skeptics might consider it a longer-term scenario. The chart below shows one possible range of results given different strategic responses of domestic producers. The trade literature shows that domestic producers are likely to respond to taxes on imports by raising their own markups and prices. The lower-bounds for the estimates in this chart arise if domestic producers do not raise their prices or markups at all, while the upper-bound assumes that they do so by 5 percentage points (half of the 10 percentage point increase that buyers see in import prices). Embedded in the estimates is a very stylized impact on prices firms face for imported inputs. I assume that firm expenditures on imported inputs are 10 percent of the size of their revenues. These imported input prices rise by half of the border adjustment tax and firms pass this increase in costs into the prices they charge on their own products. This piece of the estimation is more stylized in the sense that it does not take into account either (1) how the import cost share varies across industries importing intermediate goods and their multi-level input-output channels as in Ossa (2015), or (2) the possible impact of price spillovers from the border adjustment tax into the prices that domestic producers of intermediate goods charge U.S. buyers of their products. 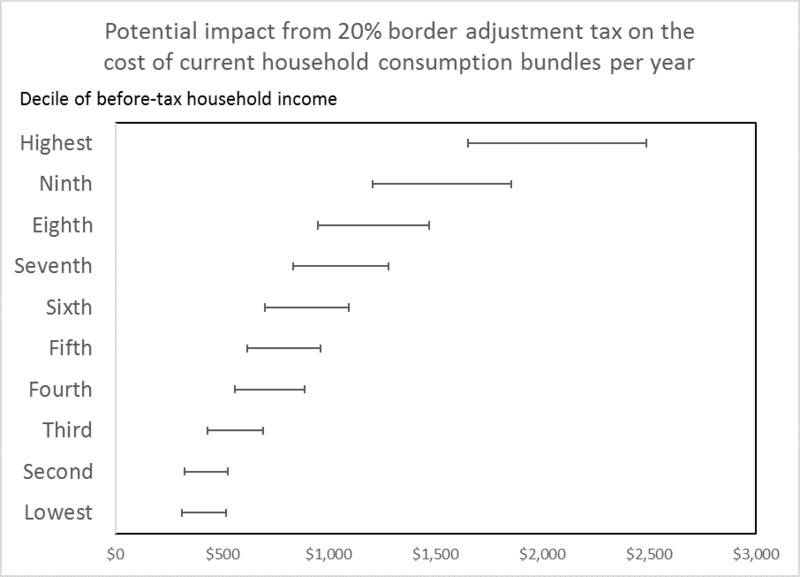 The impact of the border tax adjustment on the cost of current household consumption bundles is greatest for lower-income households when looked at relative to household income. The chart below shows that even the lower-bound of this impact has the potential to greatly exacerbate the regressivity of the current taxes on imports, showing the estimates assuming zero spillover into the prices of domestically produced goods. The cost of the current consumption bundle has the potential to increase by an amount roughly 2 percent or more for the lowest three deciles of the household income distribution, but roughly 1 percent for the upper three deciles. For full details of methodology and the matching of the tariff schedule to the Bureau of Labor Statistics Consumer Expenditure Survey, including a discussion of caveats and paths for future research, see Furman, Russ, and Shambaugh (2017). Fajgelbaum, Pablo and Amit Khandelwal. 2016. Measuring the Unequal Gains from Trade. Quarterly Journal of Economics. 131: 1113-1180. This post written by Kadee Russ. This entry was posted on January 29, 2017 by Menzie Chinn. Can anyone cite a single historic example of a currency rising enough to offset a higher tariff? Most consumption taxes are regressive. Import taxes are ultimately consumption taxes. A tax-less, regulation-less, free for all may be less regressive, but completely chaotic. So, it is left to the bureaucratic elite to decide who wins and who loses in the economic game of taxes and regulations. Simpler solution: a tax rebate based on income and median consumption model. Conclusion: import tariffs (taxes) are just another government funding scheme… live with it. Bruce Hall You need to distinguish between taxes that are intended to correct market failures and taxes that are intended to generate income. Taxes that are intended to correct market failures make the economy more efficient and are a good thing. Granted, they may also be regressive, but as problems go that’s a relatively easy one to fix. Just write households a rebate check. Carbon taxes fall into that category. Things like fuel mileage standards fall into the category of “second best” approaches. And you surely cannot do an economic analysis by only looking at lost jobs in the automobile industry. The best way to avoid having to settle for “second best” approaches is to insist on a “first best” approach. Import tariffs are probably not even a “second best” approach. If you want to put most of the incidence on the exporting country, then you also end up maximizing the deadweight loss. And if you want to minimize the deadweight loss, then you have to shift most of the incidence onto the consumers of the importing country. A better approach is to not waste money on some stupid wall. As to bureaucratic elites making decisions…if only it were true. The federal government employs around 50% of all PhD economists. For those kinds of folks designing optimal tax and rebate arrangements is considered a fun science project. You should be more worried about elite corporate managers trying to use political influence and lobbyists to warp tax policies. You need to distinguish between taxes that are intended to correct market failures and taxes that are intended to generate income. Taxes that are intended to correct market failures make the economy more efficient and are a good thing. You go on to cite fuel mileage regulations. Why not include gasoline blend regulations? These regulations don’t come free and they don’t necessarily “make the economy more efficient”. Now, if you want to say they achieve a particular goal that the market would otherwise ignore, I’d agree. But let’s use Europe as the logical extension of your reasoning where automotive market choices are highly limited as a result of selective market correcting regressive taxes. Is that what our goal should be? There is a not-so-fine line between common safety and health protection, and arbitrary mandates that are ideologically based… such as the doubling of mileage standards in less than a decade. Such doubling will not noticeably/appreciably change air quality and will significantly reduce the affordability of vehicles for those in lower income groups. Extremely regressive. As to the federal government employing only 50% of the economists, would the regressive nature of government taxes disappear and the economy/product costs improve for the lower income groups… without destroying the marketplace? Didn’t the Soviets and Maoists try that? But, of course, other studies will come to different conclusions. Not necessarily true. We have continued to improve gas mileage without much increase in automobile costs. and improving gas mileage is an alternative to increasing the supply of gasoline, which drives down cost for low income groups as a whole-even if they do not own one of the newer improved automobiles. focusing only on the pollution side ignores many of these other benefits. unknowingly, you are taking the position that the world is cheaper and cleaner without the improved gas mileage regulations. very difficult position to defend. 1. we are not discussing “the world”, we are discussing tax and mandate impacts in the U.S. If China wants to have an economy based on regressive taxation, that’s their choice. 3. the impact would be regressive in several ways including a) less choices for the lower income groups, b) higher costs for the lower income groups, and c) fewer jobs for the lower income groups. But your example meets the preconceived notions of certain economists. the discussion is perfectly valid limiting it to the us. this was an odd comment from you. your link is to comments from an auto ceo with a biased perspective on the mandates. he provided no details into where those “million lost jobs” comes from-its kind of like trump speak. but with the continued rise of the electric vehicle, one should reconsider their position against efficiency of automobiles. it is baffling that people still believe more efficient automobiles are evil. Baffled, says: “it is baffling that people still believe more efficient automobiles are evil.” Just a two word answer — VW diesels. By most measures they were MORE EFFICIENT, using less fuel and getting more power. Nearly all decisions are compromises, but only liberal versions of the compromises matter? corev, you fail to mention the VW diesel violated its emission standards-intentionally. so it was not more efficient. you used a poor example. i could get boosts in power and gas mileage if i violate emission standards on gasoline powered cars as well. but i will take a more efficient unleaded gas powered car over its predecessor. and i will take a more efficient diesel powered car over its predecessor. it is foolish to take positions that essentially deny the benefits of such efficiency. moving from comparing gasoline to diesel requires more detailed metrics in the comparison-one you did not provide. corev, you are dancing around the point of the discussion. you are unwilling to admit that efficient automobiles are a positive to the economy and the world, and that regulations which produce increased gas mileage are actually beneficial. you cannot admit to this because you have an ideology in favor of fossil fuels and against global warming. it is a sign of weakness to admit efficiency, even mandated, would be a good thing considering this ideology you support. corev, you are smiling because you know i am right. you cannot admit that more efficient automobiles are a good thing. because it hurts your global warming and fossil fuel positions. you have no response. you look like a fool if you say efficient automobiles are evil-and your ideology wants you to say so. but you know how stupid that sounds-and you cannot talk your way around it. hence you smile and take the beating. Bruce Hall Why not include gasoline blend regulations? These regulations don’t come free and they don’t necessarily “make the economy more efficient”. I completely agree. Blending ethanol is stupid. And we have way too many different gradations of blends by geographic area. We need different blends for different seasons and different locales, but I agree with you that there are too many right now. I remember when leaded gasoline was a hot topic. We heard all kinds of wailing and gnashing of teeth from automakers. And the usual apologists pretended that lead in the air was no big deal. They were wrong then and their heirs are wrong today. BTW, my dad always used to wonder why they charged extra for adding lead when it first hit the market, and then charged extra for taking it out in the late 1960s. As I said, that’s an example of a second best approach. But doubling mileage standards would significantly reduce CO2 growth coming from cars. Didn’t the Soviets and Maoists try that? No, they didn’t. Soviets and Maoists did not believe in the concept of marginal economics. That’s why rectangular isoquants are called “Leontief” production functions. As far as I know that are only two remaining government entities that still believe in Marxist economics: North Korea and the Pentagon. Removing lead from gasoline may have been one of the best health-based regulations in the history of US regulation, although clamping down on auto on other emissions may rival it (as in LA air in the 60s). Bruce Hall Since you brought up the issue of CAFE standards in the context of regressive taxes, you might want to check out a new study on the subject. NBER working paper #22925, “Are Fuel Economy Standards Regressive?”, Dec 2016. The authors conclude that CAFE standards are progressive when looking at new cars, but regressive when you include used cars. The authors see CAFE standards as a second best solution. The best solution is a carbon tax with a lump sum rebate. That approach is progressive and strongly benefits the bottom two quintiles. The also estimate the lagrangean shadow price (lambda) of CAFE standards. It turns out that the shadow price is very close to the $40/ton cost estimated in a carbon tax or cap-and-trade approach. Awesome analysis! Hopefully policymakers pay attention to this and drop this insane tax!!!! A recent study by Sergey Nigai presented at the Royal Economic Society’s 2015 annual conference comes to the opposite conclusion. Which study to believe? Personally, I take a dim view of the current state of empirical economic research. Without very careful controls it is possible to construct an empirical study to prove anything you like. A proper understanding of scientific method in formulating studies where we cannot conduct controlled experiments is almost entirely absent from economic debate. To be thorough we need also take into account impact of higher demand on domestic labour. It would have an effect on wages, certainly bigger on lower incomes. So what is net effect?